The Luxury Alpaca 2550 Pocket mattress is likely to be the most popular mattress in this new range of four mattresses as it comprises of a no turn easy care mattress that contains Alpaca , Pashmina and pure new wool layers to created a Sumptous Standard medium feel. The mattress is further enhanced with 4 rows of side stitching and has hand tufted woolen tufts with a soft touch durable damask cover . 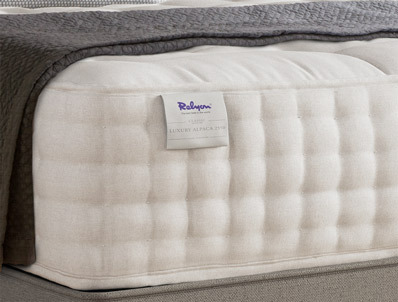 In our opinion although this mattress has 2550 springs we still look at this as a budget mattress as non turnable and models like Chatswoth and Braemar are superior in Quality. Spring Counts 1440 Single 2213 Double 2550 King and 3128 Super King Size .